In a tournament staged almost entirely in Canada, the focal point was a Canadian team so deep that three future Hall of Fame members were cut in training camp. Despite all that talent, there was no questioning the authority of Canadian coach Mike Keenan. "The very first practice we had in Montreal was by far the hardest I've ever had to start a training camp," said Kelly Hrudey, one of Canada's goaltenders. "Mike really set the tone that first day." Despite Keenan's punishing camp, Canada started the tournament with a sluggish 4-4 tie against Czechoslovakia. They would find their footing, though, posting a 3-0-2 round-robin record before avenging their opener with a 5-3 win over Czechoslovakia in the semifinal. The win earned the tournament hosts a spot in the final against a powerhouse Soviet team. Throughout the tournament, the Canadian charge was led by Wayne Gretzky and Mario Lemieux. Arguably the best two players in the world, the pair finished first and second, respectively, in tournament scoring despite Keenan's early refusal to play them on the same line. "I didn't show that particular duo early in the tournament because I didn't want anyone to have an opportunity to build a strategy against them," Keenan said. "I never discussed it with anyone, not even my coaches." The final opened in Montreal on Sept. 11 with a 6-5 Soviet victory courtesy of Alexander Semak's overtime goal. 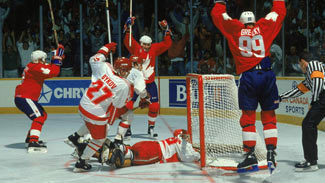 Lemieux's double-overtime winner and Gretzky's five assists helped Canada even the series two nights later in Hamilton, Ontario, a 6-5 win Gretzky called one of the best games he had ever played in. "It was exciting just sitting in the dressing room, seeing the two best players in the game on the same team," said Larry Murphy, another Canada defenseman. "It wasn't like an All-Star Game, where you go through the motions. They were definitely driven." In the decisive third game on Sept. 15, Keenan finally opted to play Gretzky and Lemieux together, placing them on a line centered by Mark Messier. But when the Soviets scored three unanswered goals in the game's opening eight minutes, it was apparent Canada would need a yeoman's effort from the entire team, not just one line. Rick Tocchet and Brian Propp, who both played in Philadelphia under Keenan at the time, cut into the deficit, and Dale Hawerchuk eventually gave Canada a 5-4 third-period lead. But when Semak tied the game 5-5 late in the third, Keenan decided to take Messier off his top line in favor of Hawerchuk, sending the trio out for a defensive-zone faceoff with less than two minutes remaining in the third. "I coached Dale in junior, so I knew him well. It was just a gut instinct," Keenan said. "As it turned out, it was a successful move." Hawerchuk won the faceoff and seconds later Gretzky set up Lemieux's winner with 1:26 remaining in regulation. The goal gave Canada another 6-5 win and a highlight that remains engraved in hockey lore. "The whole place was going bonkers," forward Kevin Dineen said. "It wasn't just in the building. You felt it across Canada. I don't think you can look back and find three more entertaining games." As one of the last international hockey tournaments pitting the NHL's finest against the vaunted Soviet national team, the 1987 Canada Cup proved to be a turning point for the sport. But it's mostly remembered for some of the best hockey anyone has ever seen. "That was the highest level that I have ever played," Hrudey said. "I remember coming back to play in the National Hockey League after the tournament and I couldn't believe how slow the NHL was, which is ridiculous." Lemieux's performance catapulted the Pittsburgh Penguins center to superstardom and the 1997 NHL All-Star Game would be the only other time he and Gretzky played together. That's just one of several reasons the summer of 1987 was a memorable one for the entire hockey world. "It was the highlight of my playing career. I never won a Stanley Cup, but talking with some guys who won the Stanley Cup, some of the Oilers, I asked them if this was anything like it," Hartsburg said. "They said it was exactly like it, maybe even more [special]."